Isuzu India has launched the new D-Max V-Cross at Rs 12.49 lakh (ex-Chennai). The on-road price for this lifestyle offering is Rs 15.20 lakh. It is billed as an Adventure Utility Vehicle, and Isuzu is targeting customers who like a vehicle that has a lot more luggage carrying capacity than an SUV. The pick-up comes with a 2.5-litre, 136PS engine that develops 320 Nm @ 1,800-2,800rpm. The engine conforms to BS-IV norms. The 4WD system is of the shift-on-the-fly type. Isuzu says that the chassis frame is designed using its iGRIP (Isuzu Gravity Response Intelligent Programme) which keeps the body roll in check when driving around tight bends. Design wise, it looks like the standard D-Max, but the distinguishing bits include a beefed up look, higher ground clearance, 16-inch alloy wheels, roof rails, chrome finished front grille, ORVM and door handle. The interior features steering-mounted audio controls, 7-inch touchscreen infotainment system and automatic climate control. The front seats feature six-way adjustability to ensure a comfortable driving position. The cabin also has nifty storage spaces, like the split glove box and a storage bin under the central arm rest. There are compartments on the door trimmings too. The D-Max gets dual front airbags and ISOFIX anchors for child seats. 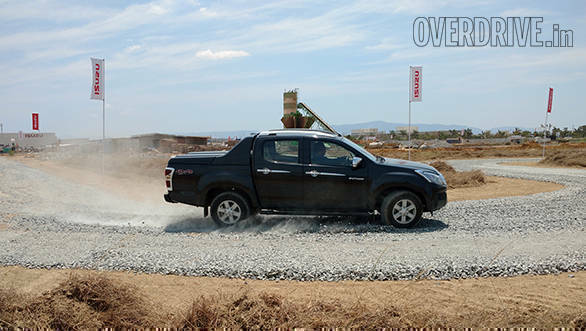 Isuzu adds that the open deck presents greater load carrying capacity than an SUV. 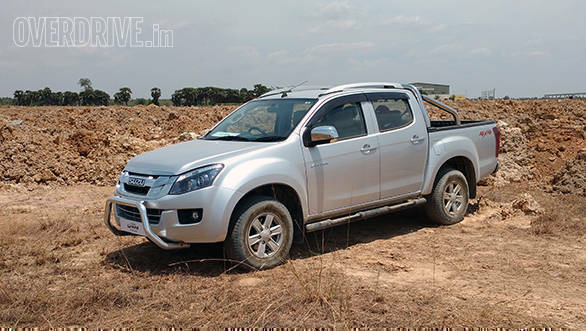 The new D-Max V-Cross will be produced at the Isuzu's new factory in Sri City, Andhra Pradesh. We drove the D-Max V-Cross around a designated course. You can read our preview on the new D-Max V-Cross here. Meanwhile, for the comprehensive road test watch this space.